The track "Shameless" is a cover of a Billy Joel song, previously recorded on his 1989 album Storm Front. According to music review website Allmusic, Ropin' the Wind is the first country album to debut at No. 1 on the Billboard 200. Brooks commented on the album saying: "Ropin' the Wind was what we called the son of Fences. Ropin' the Wind was made in this kind of tour that we were on from No Fences. We were gone, pretty much 250 days out of the year. And in that remaining 100 days, I elected to cut Ropin' The Wind, and try to write for it. This album became a lot bigger than I ever thought it could possibly be. And when I listen to the singles off of it like 'Rodeo', 'What She's Doing Now', 'The River', 'Papa Loved Mama', and 'Shameless', I look at it and stand very proud. And then when I also look at the cuts, 'Against The Grain', 'Cold Shoulder', these songs I am equally proud of." Ropin' the Wind debuted at No. 1 on the U.S. Billboard 200, becoming his first, and No. 1 on the Top Country Albums number-one album selling 400,000 copies, becoming his second No. 1 Country album. 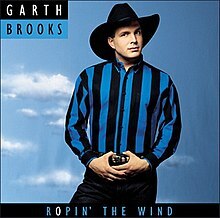 In September 1998, Ropin' the Wind was certified 14 x platinum by the RIAA. ^[a] – This track was not on the original release of the album. It first appeared when the album was re-released as part of Brooks' first Limited Series box set collection, and remained part of subsequent releases of the album until 2014, when it was released digitally for the first time. ^ Erlewine, Stephen Thomas (1962-02-07). "Garth Brooks". Allmusic. Retrieved 2012-03-07. ^ "Garth'S Cd'S". Angelfire.com. Archived from the original on 2012-11-11. Retrieved 2012-03-07. ^ "Hits of the World – Ireland". Billboard. Nielsen Business Media, Inc. 23 April 1994. p. 47. Retrieved 21 July 2012. ^ a b "Garth Brooks : Chart History". Billboard.com. Retrieved 2013-07-26. ^ "Top 50 Albums Chart – Australian Record Industry Association". Ariacharts.com.au. Retrieved 2009-12-30. ^ "Canadian Recording Industry Association: Certification Results- February 15, 2010". CRIA. Archived from the original on September 22, 2012. Retrieved 2010-02-15. ^ "Gold & Platinum – February 12, 2010". RIAA. Archived from the original on September 24, 2015. Retrieved 2010-02-12. This page was last edited on 10 November 2018, at 22:41 (UTC).